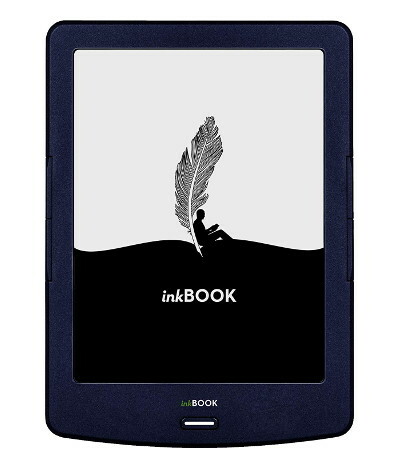 The InkBook Lumos is a low-cost 6-inch ebook reader from a small company based in Poland. The device is positioned between the InkBook Prime and the InkBook Classic 2, which I reviewed last year. The Lumos is a lot like the Classic 2, and both share the same design, but the InkBook Lumos adds a frontlight. For $30 more, the Prime HD adds a higher resolution screen, Bluetooth for audio, and a glass screen on front, but most of the software features are the same between the two. The InkBook Lumos runs a customized version of Android 4.2.2. It doesn’t come with Google Play but it does support installing apps, which can be hit or miss with the combination of the E Ink screen and such an old version of Android. The device comes with a few pre-installed apps, including a basic appstore with some additional reading apps, such as Kindle, Nook, Kobo, Moon Reader, Pocket for web articles, and some others. There’s also an app for downloading free ebooks from websites like Feedbooks, and there’s an included Polish bookstore since that InkBook’s home market. The InkBook Lumos currently sells for $99 from Amazon and €99 from the InkBook website. It has a nicer design and more features than the entry-level Kindle, including a better screen, with four page buttons, a memory card slot, and a frontlight with adjustable color temperature. It runs Android and is open to install apps, including additional reading apps. The InkBook software is prone to crashing and freezing up, it’s often slow to respond, and the Android version is majorly outdated. The frontlight is too bright at the lowest setting, and the color temperature adjustment is more subtle than other brands. It has the lowest resolution screen that E Ink offers for 6-inch ereaders. To me the design of the InkBook Lumos is much nicer than the entry-level Kindle and Kindle Paperwhite, and all the current Kobos except the Aura One, but the crux of the matter is the built-in reading software isn’t close to the same level as those devices in terms of overall features and customization settings. It’s a nice bonus being able to install apps to broaden the overall functionality of the device, but Android apps aren’t designed for E Ink screens so most don’t work well and the core reading software is too basic and prone to random problems to rely on. The InkBook Lumos has a nice lightweight design that makes it comfortable to hold, and it offers a good amount of features for the price, but unfortunately the software is simply too buggy and unpredictable for me to recommend this device. 6-inch E Ink Carta screen. 800 x 600 pixel resolution (167 ppi). Frontlight with adjustable color temperature. 4GB storage space (~1.8 GB available). Supported formats: EPUB, PDF, Adobe DRM, MOBI, TXT, FB2, HTML, RTF, CHM. Sells from Amazon for $99. Does it fit the same Yoga cover as Prime? I don’t have one but according to the product listing, yes. The 6-inch Inkbooks are all the same size.